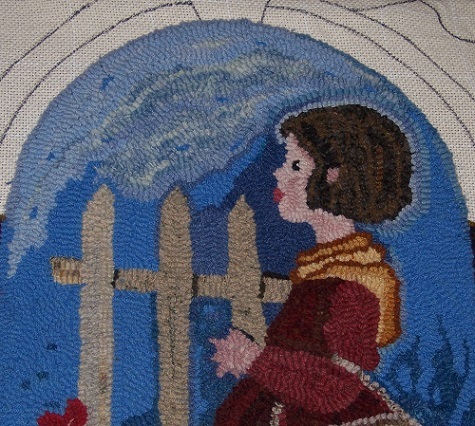 I have been able to finish the hooking on this piece and am happy with the experiment with the dust-dirt colours on the border!!!! This was fun to simply do colour and design experiments as I went along! The leaves are done with a plaid on one side of the leaf and then leftover woolworms in greens on the other side of each leaf. 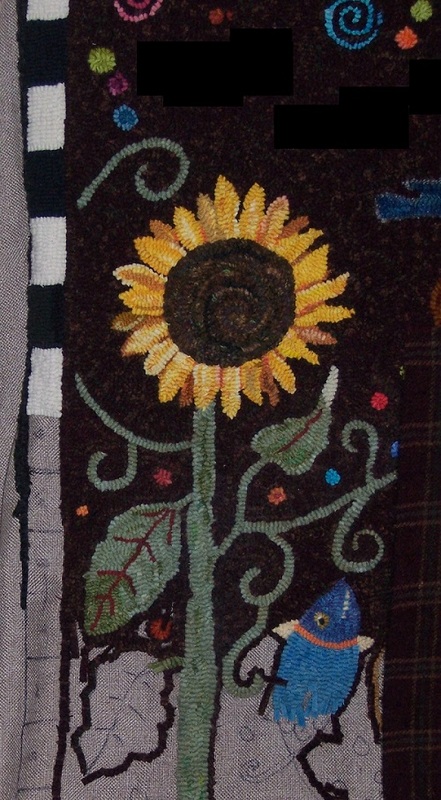 Of course, the background of the border is a plaid and the flowers are different textured wools. I used some leftover worms in the blue sky, leaf veins and in the little girl’s dress. The “path” is also plaid and textures cut worms and leftovers!!! Here is the finished piece…I am doing the edge-whipping now. 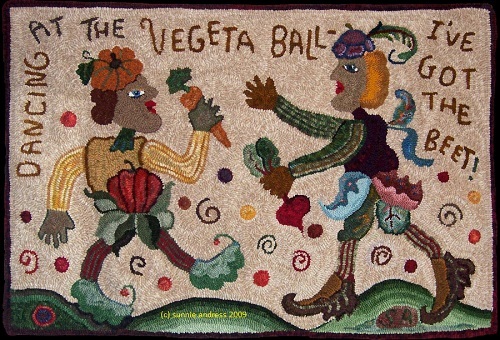 My oldest daughter is a wonderful gardener and she loves this…so I am giving it to her! Next, the border flowers are no longer dogwood blossoms but are now “padulas” so that they will not draw attention to themselves. 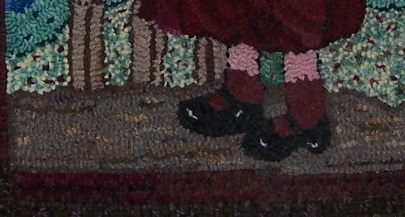 They just softly blend in with the border background (the checked wool with the brown and green lines in it). I am also using the green in the “wools” photo for the vines and half of each leaf. the rest of the leaf is hooked in green leftovers! Now I know that this border looks somewhat dull…(!!! )…however, if you can visualize these large flowers hooked in some of the colours I am using in the center, you can probably see that they would be overpowering and take away focus from the center figure. Even if they complimented the center, some of the colours I tried (using small pieces of wool placed on the flowers) made the eye jump to 6 places around the border and then back to the center. Again…not what I wanted…! I did not put brown accents in the center flower but will try them in the upper left and upper right flowers when I get to them. I thought the change to a different flower petal colour was enough for the center flowers. Here is more hooking on the lower center…I’m glad to be getting farther along on the center as well as that big border!!!!! I am going to take out the dark brown on the fenceposts…I find it too distracting!!!! I have also hooked the fenceposts and am trying a flower colour to see if it works. I’m working in my usual way, not trying to be “realistic” but to present the focus area in such a way that the viewer “sees” her/his own reality of childhood gardening!!!! 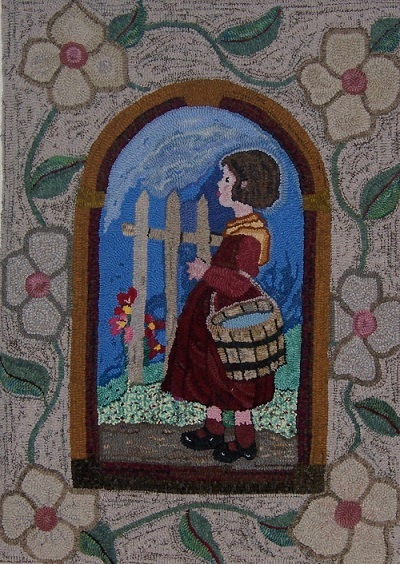 I am not sure if the border was taken from an old illustration or if it was adapted from a stained glass image but both were taken from Dover books for artists and craftspeople. I find that many of the Dover illustrations are great to use or adapt because that is what the books are for…and many of the designs are out of copyright and can be used without special permission! Since I have now used up all of the blue wool that I had folded up with the rug, I now will need to go to my own stash of wool and try to use colours that will go with the bodice of the dress (hooked years ago) as I hook the skirt. Recovering from a little surgery yesterday so I am resting and not hooking for a few days. However, I was doing a bit of sorting last week and came up with a piece that I had started hooking on Monk’s cloth about 12 years ago. It is a combination of several things from Dover books and, when I drew out the design, I remember thinking that I would do it in “sweet” pastel colours. 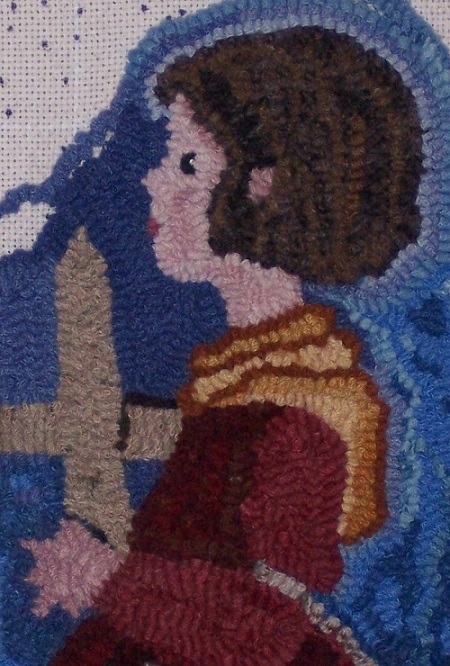 But for some reason (back then), I changed my mind as the little picture of the start of the piece has deeper colours. 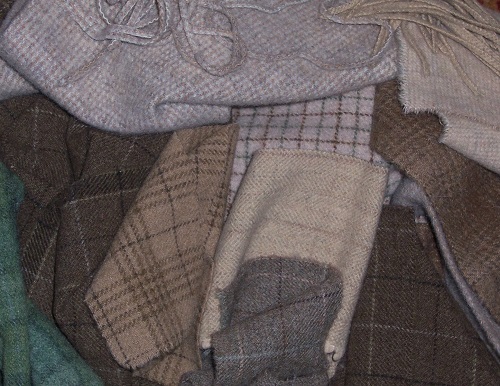 I will carry on with those colours and see what I have in my stash that will go with what is already done!!!!! Hooking on monk’s cloth again will be different too…but I enjoyed it back then and will probably enjoy it once again!!! Sorry to have been away so long!!!!!! However, I did have a great time at Rockaway Beach, Oregon at Rug Camp the first week in April and learned a lot from my teacher, Laura Pierce!!! 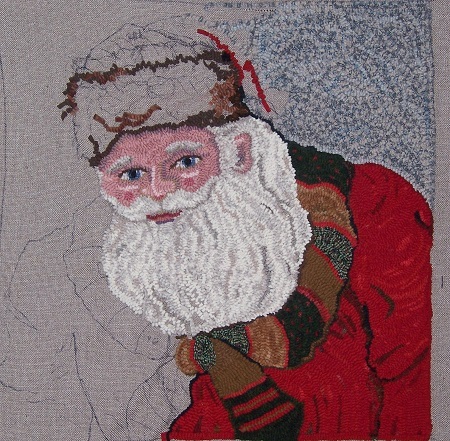 I had decided to do the head and shoulders of a Santa (more like a Father Christmas-not the “jolly” guy) and had hooked the right side of the rug before camp…with the blue, gray and off-white plaid for the sky and the reds for his coat. Since I wanted him to be “different” (like Mr. Morty!!! ), I decided that his Grandma had knitted a scarf for him (!) and he is wearing that around his neck instead of the traditional fur. This Santa is adapted from an old postcard that shows a full Santa figure sporting lots of fur with a large bag of toys, etc. However, I wanted to focus on what was really important…and I narrowed it down to a head-and-shoulders portrait. It is about 22 x 22 inches and uses mostly #5 and #6 cuts and here is Progress so far…..